Aerial Artistry offer hundreds of top entertainment options from around the world and have an impressive collection of ‘WOW Factor’ entertainment options. We understand the need for event entertainment to be bigger, better and more exciting year on year, and so we pride ourselves on keeping ahead of current trends and cutting edge entertainment options. From dancers in giant bubbles and champagne serving aerialists, to magicians and circus performers, Aerial Artistry represents a huge variety of options for a range of budgets. 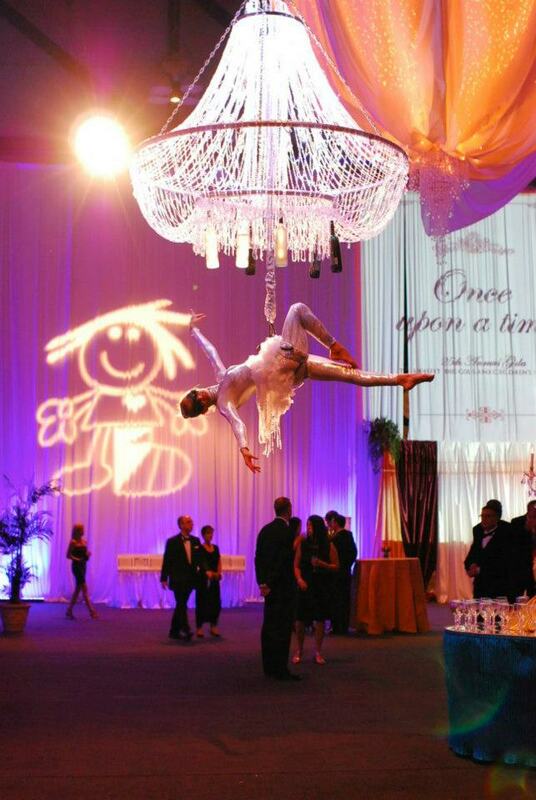 Living Carpet Electric Violinist, Acrobats,Opera Singer, Aerialists, Sand Artists, Dance shows and more….Aerial Artistry has available the best Champagne Aerialists and Aerial Bartenders for corporate special and international events. Contact us for a range of Champagne Aerialists for your event. Strolling Champagne Diva Dresses are stunning dresses that doubles as a serving station! All events – weddings, bar/bat mitzvahs, birthdays, corporate functions, marketing events, children’s parties, trade show, awards ceremony – become special events, when a unique entertainers performs. Looking to hire unique Entertainment Aerial Bartenders? Jugglers? Aerial Acrobats? Strolling tables ? Magician? belly dancers? From boxing exhibitions to promotional models, from Las Vegas New York, Miami an more Aerial Artistry has the unique variety entertainment available for your next event. Our Concession Designed and created by Aerial Artistry Aerial Bartenders or ‘Champagne Chandeliers’ are a unique and stunning entertainment concept for any event! A timeless rink, loved by all for its smooth texture and sophisticated feel, Champagne is the true measure of a great night out. And just when you thought it couldn’t get any better, we bring you a service that will absolutely WOW your guests. Our Aerial Bartender available for you next event. es this act consists of (2) 30 Minute or (3) 20 sets performances in which our performer is hanging (upside down!) from the ceiling above her audience surrounded by a beautifully designed crystal chandelier. 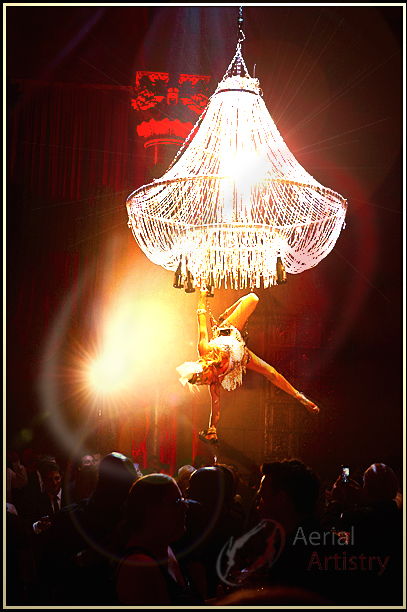 While hanging through the chandelier, she dances her spectacular choreography while pouring flutes of champagne to the crowd below this is a wonder you have to see to believe. Performers can accommodate any beverage from champagne to freshly made cocktails. We currently have 3 different sizes available!! 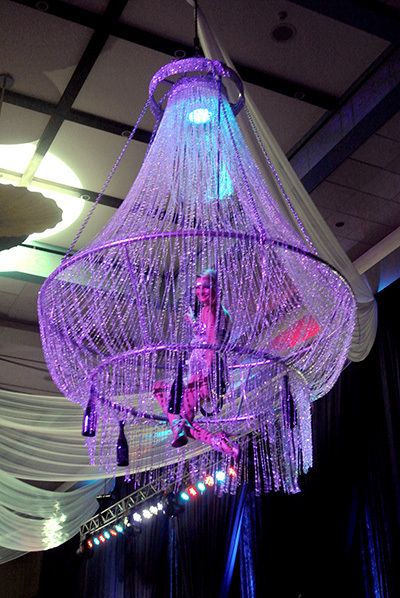 All chandeliers come with chandelier, costume, aerialist, assistant, rigging, and lighting. WOW Factor entertainment – amaze guests as they enter the room 1 hour service includes pouring champagne or wine with aerial acrobat Have this setup during the cocktail hour in the main lobby. Have this set-up above the wedding reception dance floor while you party Solo and multiple Aerialist are available upon requests Instead of having servers handing glasses to guests, we can do our chandelier models or strolling tables! Chandelier Models, Strolling Champagne Diva Dresses or Strolling Table Aerial Artistry will send you a videos on the Aerial Bartenders’ profiles. This is the single most important indicator of whether or not this Aerial Bartender is right for your function. 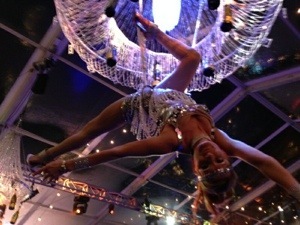 Aerial Artistry will help you to understand if Aerial Bartender will be appropriate for your event? Most Aerial Bartenders, variety entertainment services and live event entertainment are custom for each client. if you looking to create a custom live entertainment experience for your next event? If you have a seemingly off the wall idea. I’m sure we have a unique way to make it happen! 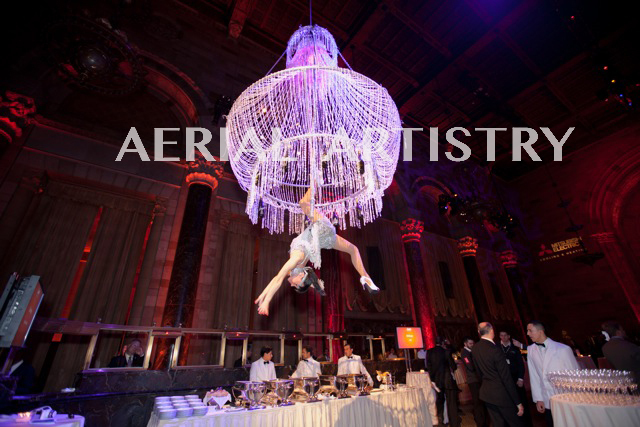 contact us today http://www.AerialArtistry.com Call today for a quote 1(917)755 7744 or send us EMAIL has available the best Champagne Aerialists and Aerial Bartenders for corporate special and international events. 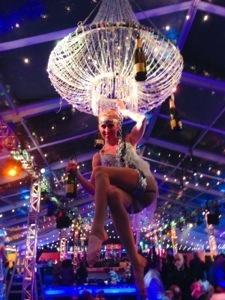 Contact us for a range of Champagne Aerialists for your event. As a first-timer there is a little you can do to really prepare for the Kentucky Derby except show up. Sure, you can have the perfect dress and hat, tickets, and a great group of friends in tow, but once you’re in, nothing is quite what you’d expect. It’s tailgatin meets an elegant country brunch, with a touch of old-world nostalgia and a whole lot of rowdiness. Here is what a couple days of Derby looked like for two SL editors. Friday, May 2: The Oaks 8 to 11 a.m.: Suiting up. This isn’t the place to skimp on on style. We partnered up with Gus Mayer for our Derby looks. Thanks Gus! And yes, phones are also a main accessory at Derby. 3:45 p.m.: Scoping style. Out of 200 contestants, Carson Cressley, Simon Baker, and Stephanie awarded best in show to this lovely lady who stood out in her quirky get-up during the Longines Kentucky Oaks Fashion Show. 5:15 p.m.: Drinks, like a local. We found our favorite mint julep at Rye on Market Street—not too sweet with a bushy sprig of fresh mint. 11:18 p.m.: Galas and secret concerts. Dierks Bentley and Miranda Lambert duet at the Barnstable Gala. Run by Patricia Barnstable-Brown and Cyb Barnstable (former Doublemint Twins), this soiree runs into the wee hours of the morning at their sprawling estate. Other close encounters of the celeb kind include: Boyz II Men, Richie Sambora, Pete Wentz, and Mary Wilson. The takeaway—musicians love Derby. 1:10 p.m.: Red carpet interviews. Laura Bell Bundy impresses us with her horse betting knowledge, and Johnny Weir tells us the inspiration behind his pegasus hat. 8:20 p.m.: Small plate-palooza at Ed Lee’s Milkwood. We can hardly resist ordering a second helping of his spicy chicken and waffles. 11: 14 p.m.: Party at Hotel 21C Museum Hotel. Morph-suited models, glitter-throwing performers, and a chandelier hanging champagne server by Aerial Artistry —this is how Louisville celebrates the end of Derby Day. 3:30 a.m.: Calling it quits. We make our rounds to some of the local bars where the festivities continue. It’s soon bedtime for these two editors, but Louisville was made for night owls. Bars stay open till 6 a.m. on race day. By Stephanie Granada and Hannah Hayes. Aerial Artistry Aerial Bartenders or ‘Champagne Chandeliers’ are a unique and stunning entertainment concept, WE specialise in hiring the best Champagne Aerialists and Aerial Bartenders for international events. 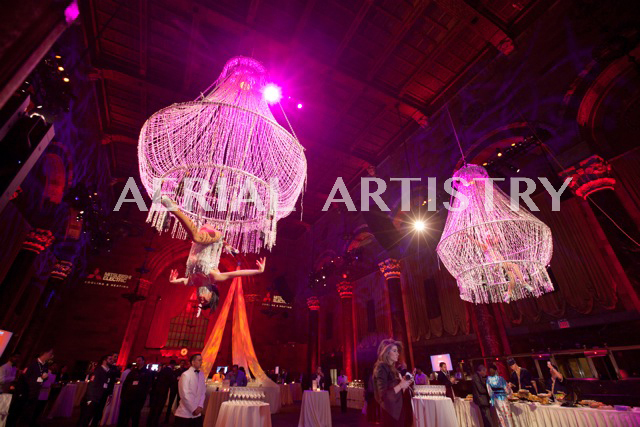 Aerial Artistry provided original and beautiful our Champagne Chandeliers Entertainment for Mitsubishi Cooling and Heating Conference in New York City at the Cipriani 42 street. Aerial Artistry translated entertainment into a unique and beautiful with such as a burlesque Aerial Bartenders dangling to pour champagne while they literally hanging upside down in the air suspending from a beautiful Crystal Chandeliers designed by Aerial Artistry. This act consists of (2) 30 Minute or (3) 20 sets performances in which our aerial bartender performs, serves, interacts with your guests, and makes them feel involved in the spectacle way! 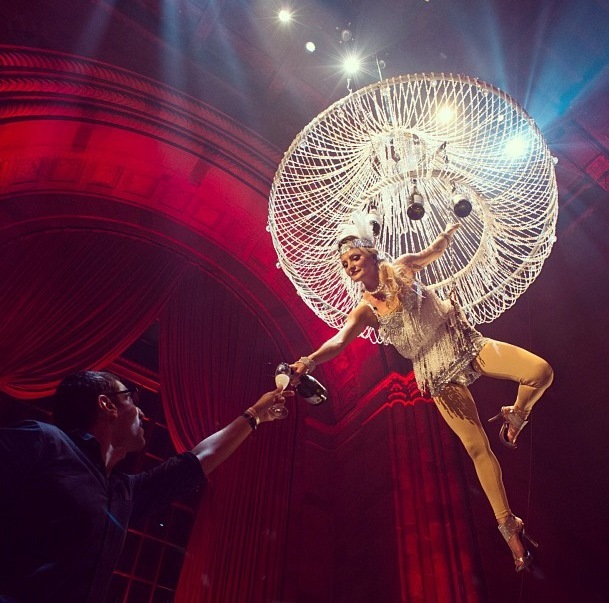 #AerialBartenders or #ChampagneChandeliers are a unique and stunning#entertainment concept for any event. Performances in which our performer is Suspended up in the air is a chandelier prop with the bottles suspended around the beautiful crystal chandelier. 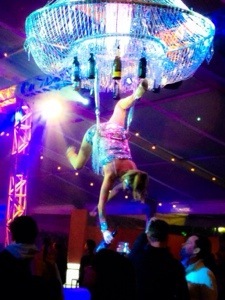 Aerial Bartender or ‘Champagne Chandelier’ is a unique and stunning entertainment concept for any event! Our beautiful glamor aerial bartenders will amaze, dazzle, amuse and enchant your guests as aerial bartender is raised and lowered on a motor as she pours the drinks directly for the guests, while literally hanging upside down and flipping and spinning through the air. We specialize in hiring the best Aerialists and Aerial Bartenders for #corporateevents #internationalevents. We currently have 3 different sizes available!! 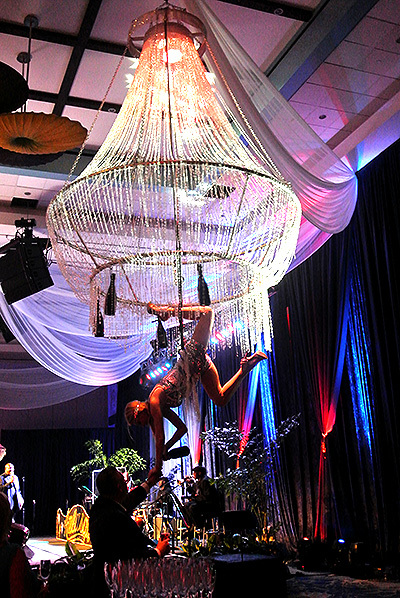 All chandeliers come with chandelier, costume, aerialist, assistant, rigging, and lighting. Our aerial bartenders can adapt big to smaller venues and are extremely flexible. They are professionals who can overcome virtually any technical problems and still give an exciting and satisfying performance. If you have a seemingly off the wall idea. I’m sure we have a unique way to make it happen! AerialArtistry present Aerial Bartenders or ‘Champagne Chandeliers‘ are a unique and stunning entertainment concept for any event. WE specialise in hiring the best Champagne Aerialists and Aerial Bartenders for international events. This act consists of (2) 30 Minute or (3) 20 sets performances in which our performer is hanging (upside down!) from the ceiling above her audience surrounded by a beautifully designed cristal chandelier. While hanging through the chandelier, she dances her spectacular choreography while pouring flutes of champagne to the crowd below. Performers can accommodate any beverage from champagne to freshly made cocktails. Aerial Artistry is the elite booking entertainment, wonderful for finding first class talent. Check out our site for more ideas and resources to help you plan a successful any event worldwide event or email http://www.aerialartistry.com for entertainment options. Following the Labor Day weekend, HBO and Time Warner Cable hosted an exclusive season-four premiere of HBO’s Boardwalk Empire. Special guests, executives and cast members, including Steve Buscemi, Kelly Macdonald, and Michael Kenneth Williams, graced the red carpet and screened the first episode Tuesday night at the Ziegfeld Theater in New York City. Following the screening, guests topped off the night with a decadent after party at Cipriani 42nd St., For an era-appropriate party Robert D’Alessandro, designer/owner at Visionary, create the atmosphere that engage all of the senses allowing guests to be transported into an extraordinary experience. Aerial Artistry translated entertainment into a unique and beautiful with such as a burlesque Aerial Bartendering dangling to pour champagne while she literally hanging upside down in the air suspending from from a Crystal Chandelier. More Information on how to hire Aerial Bartender or other elegant entertainment please contact aerial artistry by this form below. The red carpet was ready at the Ziegfeld Theater, and the reporters and photographers were waiting to pounce. But where were the stars of “Boardwalk Empire” for its fourth-season premiere? Was it possible that the Tuesday smack after Labor Day was just too soon to drag people out? When the stars and celebrities did finally show up, some seemed unprepared for the change in social seasons. The actor Jeffrey Wright had spent Monday in Brooklyn, getting his kids ready for school. June Ambrose, the celebrity stylist, had been curating a show of “Boardwalk Empire” looks. Towering behind her on the red carpet line was Tyson Chandler, the Knicks center. “Are you ready for the season?” a reporter asked him. Indeed, with New York Fashion Week coming, the talk was as much catwalk as boardwalk. Gretchen Mol, in a lacy red L’Wren Scott dress, said she would attend Sophie Theallet’s show on Tuesday. “I’m ready for things to get started,” she said. Inside the theater, Richard Plepler, HBO’s chief executive (with a deep summer tan), greeted an audience that was not quite big enough to fill the house. Then Robert Marcus, the president of Time Warner Cable, stepped up and said he had just been on the “Boardwalk Empire” Web site reading its list of gangster rules for staying on top. “Some of which I could have used in the last couple days,” he said, referring to the settlement his company had finally made with CBS, which had clearly cut into his holiday weekend. The lights went down, and the episode began on the big screen, drawing viewers into a corrupt Roaring Twenties Atlantic City with violence and costumes as fantastic as any look during Fashion Week. When it was over, the audience, which included Malcolm Gladwell, Questlove, Tyson Beckford and Sam Rockwell (still in a summery T-shirt), filed out of the theater looking slightly stunned from the bloody onslaught. They cheered up afterward at Cipriani 42nd Street, across from Grand Central Terminal, for an era-appropriate party Robert D’Alessandro, designer/owner at Visionary, create the atmosphere that engage all of the senses allowing guests to be transported into an extraordinary experience. Robert translated Aerial Artistry Entertainment into a unique and beautiful flapper Aerial Bartender dangling and pours flutes of champagne while she literally hanging upside down in the air suspending from from a Crystal Chandelier also program follow with a raucous big band. Champagne and lavish buffets of clams, oysters and shrimp as big as brass knuckles added to the excess. “HBO gives the best parties,” said Frank DiGiacomo, the editorial director of Movieline. “I’m sure we can make an arrangement for that to happen,” he said. Spoken like a true fashion gangster. 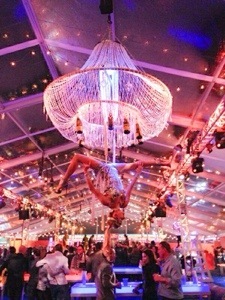 Aerial Bartenders or ‘Champagne Chandeliers’ are a unique and stunning event entertainment concept for any corporate or special events! This act consists of (2) 30 Minute or (3) 20 sets performances in which our performer is hanging (upside down!) from the ceiling above her audience surrounded by a beautifully designed chandelier. While hanging through the chandelier, she dances her spectacular choreography while pouring flutes of champagne to the crowd below. Performers can accommodate any beverage from champagne to freshly made cocktails. Our Shows can adapt to smaller venues and are extremely flexible. They are professionals who can overcome virtually any technical problems and still give an exciting and satisfying performance. Aerial Artistry will provide you with amazing first class entertainment for your event. All of our costumes are custom made for your event. We can create any theme or character you like. If you have a product or logo to promote, we can integrate it into our costuming. Your next production will include unique entertainers and Cirque performers wrapped in a contemporary fine arts program. Aerial Artistry artists will create a breathtaking experience. Aerial Artistry Entertainment can help you with selecting the best entertainment options for your Product Launch event internationally. We offer many solutions for cutting edge entertainment- from Aerialists who will dance on your building- ideal for new hotels or a new office, to violin shows that can unveil a new brand with laser art. Effective ideas for Product Launch entertainment. Japanese Drummers, Strolling table, Aerial Aerial Bartenders, Urban/ Hip funky covers group, Electric Violinist, Opera Singer, Aerial Acrobats, Speed Painting Artists, Cirque Style Performers and more. Make your product launch be the most buzzed about event of the year. Create excitement with these amazing entertainers, that will leave everyone anticipating the unveiling! Introduce Your Business or Product with a Launch Party! The best way to introduce your new business or product to the market is by hosting a great and memorable launch party. Types of launches include: record release parties, show opening galas, business launch parties, product launch parties, and retail store grand opening parties. Before you start planning the actual party, make sure to determine your target audience, the goals you want to achieve with the launch and the budget you have to spend on the party. http://www.AerialArtistry.com is here to help you with the rest!